After being diagnosed with RSD in 1997, my career had been forfeited and replaced with playing the roles of researcher, advocate, physician and pharmacist…as I was now a Professional Patient. The information on RSD was as abundant as it was scarce; so little was truly known about how to physiologically treat this baffling condition, yet the plethora of universal symptoms, suffering and damage was undeniable. RSD was isolating and lonely, yet I was not alone. Fortunately, by connecting and subscribing to the only two RSD organization/groups available (which, back in the day, was pre-social media and hard copy newsletters), I found others who were at a similar level of a dumbfounded “what now?” shock. I also joined the closest but not-so-local RSD Support Group around, later facilitating meetings in my home county. There was a profound sense of understanding and compassion bred through a shared experience of…well, misery. Friendships were forged, laughter and information were shared, and ideas were exchanged. However, there was also a commiseration in sadness, anger, frustration, fears and uggh, the horror stories. Experiencing the spread to both of my legs, a seed had unwittingly been planted: “If it spreads to an organ, I’ll die.” By 1999, upper tolerance had been reached and the last straw broken when I read a memoriam for a 12-year old girl. That was the last time I looked at ANY RSD publication, and I didn’t return to a Support Group for many years. The Story of my life had been rewritten with an unconscious consent and my entire identity had become RSD. Living and breathing an all-consuming life of illness was robbing the few quality moments offered by the Divine as respite. Fears were writing their own stories and the urge to fight “self-fulfilling prophecies” was growing stronger. I was NOT going to be a victim to RSD anymore, nor was I going to die from it. With tied hands, the medical community could offer no diagnostic equipment or standard treatment protocol, let alone a cure. How could they? They didn’t understand it. “Treatment” to address the many symptoms was patchwork at best and usually involved pharmaceuticals which usually created more symptoms. While many more years were to be spent bedridden and medicated, book studies on alternative medicine began, as did a small Yoga and Meditation practice. For every moment spent in agony, there was a determination to make up for it with a fun and creative solution to steal back time. I realized that “I” AM the creator of My Story, my destiny, my fate, and my peace. It was also reassuring to know that there was a group to reach out to if I found myself in need. However, depending on ones perspective, a safety net can gently cradle or be a restraint. I chose to secure the net beneath and traverse a tightrope leading to an unknown destination, walking away from all that validated my truth in experiences so that I might redefine “me”. Fumbling through this process took time as I became my own teacher, and guidance came through stacks of self-help books. Trying to piece together a “plan”, I was going to find HEALTH. I was going to “walk” away from this condition with dignity, grace and, most importantly, a sense of humor! As My Story began to unfold and write itself, there were many personal revelations. Whether My Story chose to include pain in the future or not, that was up to fate. What was in my control and very achievable was expanding my comfort zones to explore alternatives for relief not just in my Body, but in my Mind and Spirit as well. Eventually, this growth guided me to the most amazing teachers, counselors and education required to push through to the next level of healing. Pain/RSD was not going to define me. I had to stop giving it life force by constantly talking about my woes. Our Story is asked to be repeated over and over by the Nurses upon intake, then again for the Doctors, then with updating the Physical Therapist, then the Psychotherapist, then the Insurance Companies, then Disability — and it doesn’t stop there. No. Family and friends also get pulled into this tornadic activity that is “The Story”, perpetuating it further just by having to justify why we’re crying in agony from a mere air current from a fan on our skin or why we have frozen peas tucked into the back of our pants at the grocery store, in attempt to quell the muscle spasms inflamed by performing a simple ADL (Activity of Daily Living). And “The Story” mires in deeper reporting back to family and friends the experiences of coping to be in public within an inhospitable environment. Holy Wow. STOP! RSD is a Really Stinky Disorder. OK? It is. So my advice? Don’t own it. Do not let a diagnosis, a prognosis, a fear or a mindset based in misery define you. Be honest with yourself, understand and accept true limitations. Know that you really do not have to justify yourself to anyone for having a unique life experience. Expand your horizons as much as you can and seek joy. Seek good teachers. Stay positive. There is so much more to the world outside of RSD Land. Fun stuff. Go crazy and write a new story for yourself; make it fantastical. While current reality may not support the powers of something like a magic wand, connecting with a deep desire to spontaneously heal may be the catalyst required for movement in a new direction. Question yourself. Question everything. Be open to finding comfort in the unknown, as some answers take time. Don’t let any other person write your story. A personal experience: At 26 years of age my parents had been called in for a meeting with my Doctor in which she informed us that my prognosis was VERY poor. As she said “your daughter will never walk again”, I whimpered “yes, I will”. When she said “your daughter will never work again, get married or have children”, a tearful whispered response of “yes, I will” emerged. But when she finished with “your daughter is going to die with this and probably because of this”, my tears stopped, direct eye contact was made with the Doctor and there was no quiver in my voice as I unequivocally and sternly stated “No I Won’t”. She did me a favor, pouring a toxic fuel on my spirit; it diverted to enflame a very diminished Fire of Hope. I was going to prove her wrong… and I believe I have. I’m surely not dead; I may be limited but I’m working hard and loving it; and I’m not only walking — I’m dancing. A lot. Even when it hurts. And it’s Divine. That’s my story and I’m sticking to it. JENNIFER JONES Jennifer has had RSD for 18 years — 10 spent bedridden and the last 8 working toward more optimal health with Alternative Medicine. She attributes the application of her training (Alternative Medicine/Ayurveda, Life Coaching & Holistic Nutrition) to maintaining functionality as the RSD has spread to her arms, legs, face, side and digestive system. 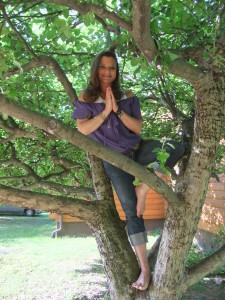 Even still, after 15 years medicated , now functioning pharmaceutical-free for 3 years, with 177 pounds lost and more good days than bad, Jen can often be found wrestling saber-toothed tigers, discovering new continents, or just climbing her favorite tree.